Using the same example, a shareholder buys 1,000 shares in Company ABC @ 100 pence per share. Firstly, we need to make sure the original share holding is listed in your timetotrade share portfolio. For the purposes of illustration only, we will assume that no commission or stamp duty was paid. 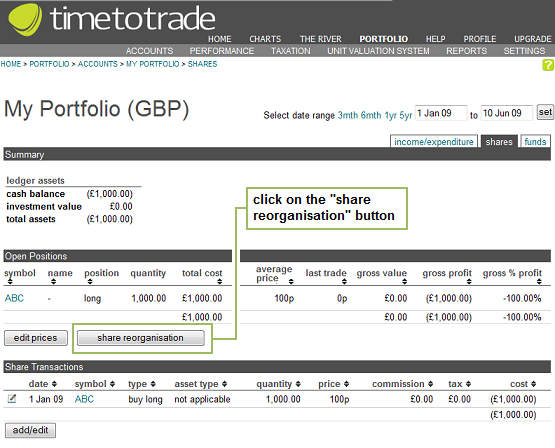 To add the Takeover / Merger, click on the "share reorganisation" button as illustrated above. This will take you through to the Share Reorganisation page. Select the date that the Takeover / Merger occurs. In this example, we will say that the date is 1 June 2009. 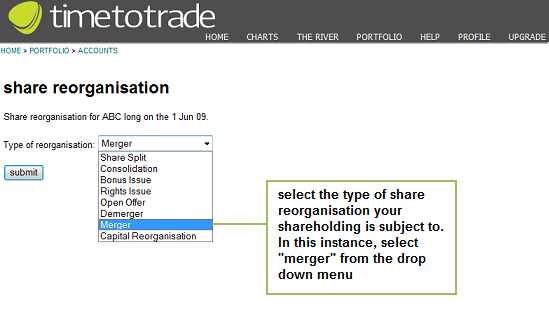 Next, from the drop down menu select the shareholding that is subject to the Takeover / Merger. 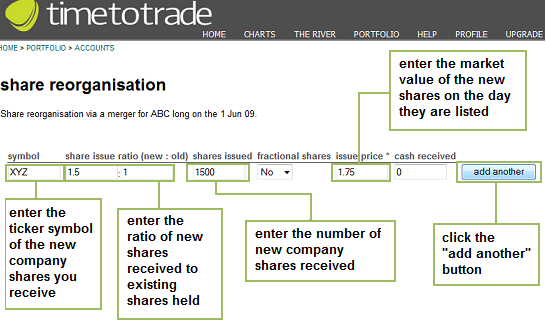 In this example, select "ABC"
Now we need to specify the type of share reorganisation. 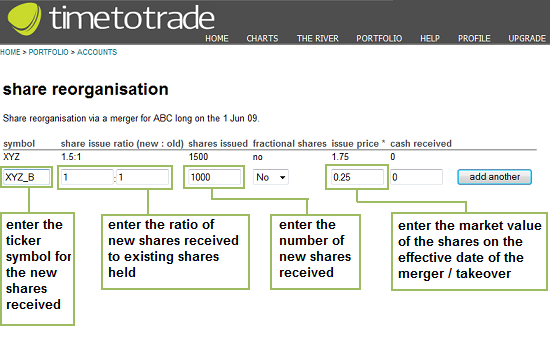 In this instance select "Merger"
Share Issue Ratio = input the ratio of new shares received for every old share owned. In this example we receive 1.5 new shares for every share in ABC plc, so input 1.5 : 1. Fractional Shares = nil in this example. If you received any fractional shares change the field to "yes". We now need to add the details for the XYZ plc B-shares which we also received as part of the proceeds from the merger, so click "add another" next. Symbol = input the ticker symbol for the second class of shares received as a result of the merger. In this instance we also received XYZ Plc B shares. We will enter these as XYZ_B. Share Issue Ratio = input the ratio of new shares received for every old share owned. 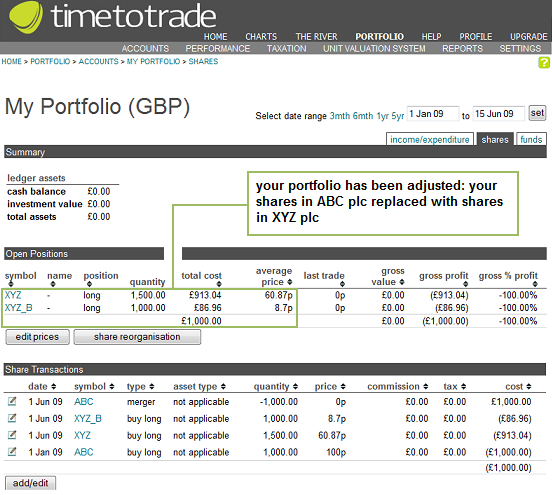 In this example we receive 1 new XYZ plc B-share for every share in ABC plc, so input ratio 1 : 1. You will now see a summary of the details input. Check the details are correct, and click on the club "click here to return to ledgers" to take you back to your share portfolio page. Returning to your share portfolio page, you can see that the merger transaction has been added to your portfolio and you no longer own shares in ABC plc, instead these have been replaced with 1,500 ordinary shares in XYZ plc and 1,000 XYZ plc B-shares. The total combined base cost for the new shares is £1,000 as expected, split in proportion to their market values on the day of the merger with £913.04 base cost allocated to the ordinary XYZ plc share holding and £86.96 allocated to the B-share holding, as expected.